GBR M2-, Bow Andrew TRIGGS HODGE and Pete REED at the 2011 FISA World Rowing Championships. Photo: Peter Spurrier. Andrew Triggs Hodge is hanging up his oar. It will go nicely with his four world championships and three consecutive Olympic gold medals he collected during his international rowing career for Great Britain. 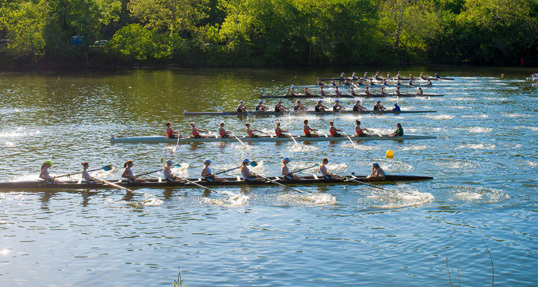 “The parts I enjoyed most about rowing was the rowing itself. Competition served as milestones for training and also it shone the light on the part I intrinsically enjoyed, the hard work and training,” he said in his retirement announcement. Hodge will go down as one of the United Kingdom’s most accomplished oarsmen, with his career culminating last August as part of the Olympic gold-medal-winning eight in Rio. That marked three consecutive Olympic titles, following victories in the men’s four in London and Beijing. His world championship victories came in the four in 2005 and 2006, and the eight in 2013 and 2014. All told, Hodge raced in 14 different world or Olympic championships. Now the Oxford resident will turn his attention to assisting rowing startups in the U.K. and improving the environmental quality of a river he knows quite well: the Thames. He will put his master’s in environmental science to use on the Thames Tideway Tunnel, a project to direct sewage away from London’s famous river. It’s hard to argue we’re better off today than before the start of this Olympic experiment. Still basking in the glow of the country’s first-ever Olympic rowing medal—compliments of those podium-pants-loving O’Donovan brothers—Rowing Ireland has announced it is tapping former Australian under-23 coach Antonio Maurogiovanni for its vacant high-performance director role.